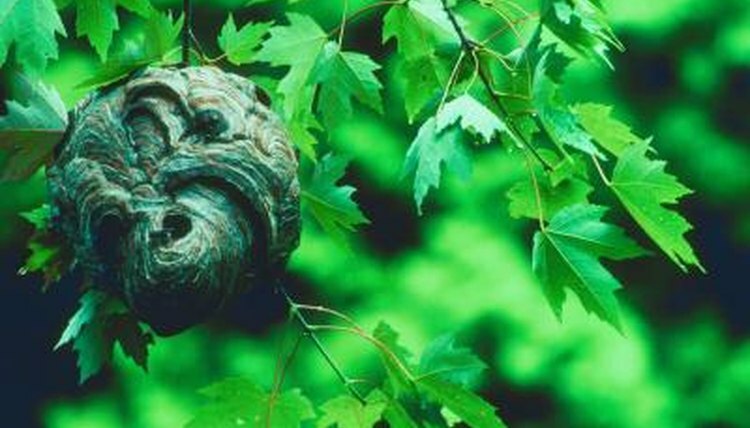 Hornets may be unwelcome in your yard because of your fear of their painful stings -- but these insects help keep other bug populations under control, and they don't sting unless they're threatened. When you're trying to determine whether the hornets you see are male or female, chances are they're female; males don't usually leave the nest until late summer or fall, then they die quickly. When you see a single hornet in spring, chances are you're looking at the queen. Hornet colonies die off every fall, leaving only queens and their eggs to overwinter under loose bark or fallen logs. Queens tend to be larger than males and worker females. European hornets, for example, don't grow longer than an inch, except for the queens; they sometimes get closer to 1 1/2 inches. After the queen raises her first batch of worker females, she'll stay in the nest, laying more eggs. By far, the majority of the eggs are worker females, who care for the young, build the nests and find food for the other hornets. In late summer, the queen lays a few male and queen eggs. When they mature, they leave the nest and mate. The males die, and the queens look for a good place to spend the winter. Even if you spy a male hornet, you aren't likely to notice a difference between him and his female worker counterparts. They have the same coloring and size.